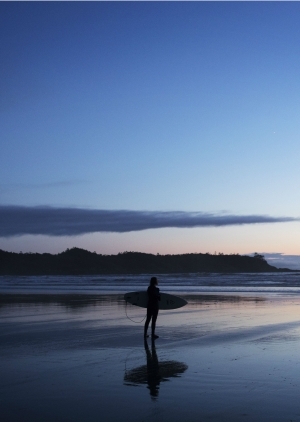 Undeterred by single-digit temperatures and seasonal megastorms, we join the hardy surfers of Tofino. If I’d been asked to imagine my perfect surf holiday, it certainly wouldn’t be this. It’s not the waves that are the problem, for they are beautifully-shaped; of a kind you might see pictured in a glossy coffee table book. They are also pleasingly small, so I can show off my limited board-riding skills without freaking out about whether a big set is going to come in and wallop me. It’s not the crowds either, as the beach seems endless and there is no one here but us. Nor is it the setting, which is sun-drenched and majestic. No, the part I’m having trouble getting my head around is that the water temperature is hovering around eight degrees, the air is cold enough to see my breath and there is a thick layer of frost on the boardwalk down to the beach. 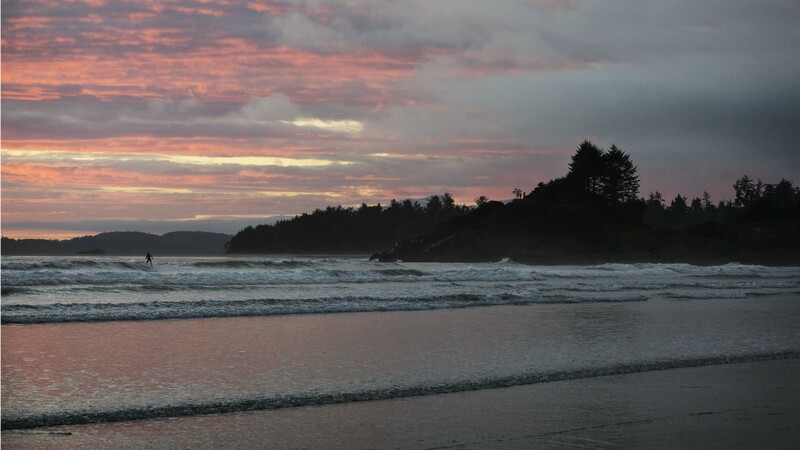 It’s December and I’m on Long Beach near Tofino on the west coast of Vancouver Island. Not far from here there are snow-capped peaks with people skiing down them; the thought of surfing today seems very wrong. Dream surf trips should involve board shorts, bikinis and palm trees. But there are no palm trees here. Instead, we have red cedars, Douglas fir and Sitka spruce. On top of our swimwear we have thick-hooded wetsuits, and even thicker boots and gloves. All that’s missing is a chain of icebergs slowly drifting by. Our instructor, Andy Herridge from Wick’d Surf Camps, is amused at all the fuss. “You’ll be surprised at how warm these wetsuits actually are,” he tells us. “Technology has come a long way. 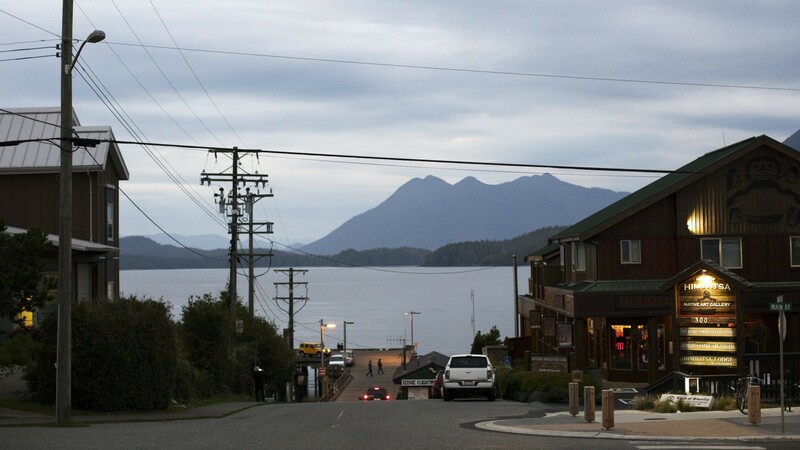 It’s made surfing here a lot more accessible.” Hardy surfers in the know have of course been flocking to Tofino since the late 1960s when word got out about the region’s awesome waves, wild nature and edge of civilization-attitude. The rare coastal temperate rainforest runs right up to the sand, and from there it’s only ocean until you reach Japan. Hippies in camper vans poured in from across Canada and were joined by conscientious objectors to the Vietnam War driving up from the U.S.
Before then, logging had been the main industry. But these new locals, alongside the original Indigenous people who have lived on the west coast of Vancouver Island for over 10,000 years, increasingly clashed with the lumberjacks over the environment. At the Clayoquot Protests in the early 1990s, 900 people were arrested for trying to protect the forest from logging, the largest act of civil disobedience in Canadian history. A protest concert was even shown on MTV, resulting in national news coverage and further increasing the profile of the area. This ushered in a new era of tourism with an appreciation of nature, the wilderness and surfing at its centre. So that’s how our group of beginner and intermediate surfers find ourselves running into the frigid Pacific Ocean a few weeks before Christmas to surf the breakers and clean green waves beyond. But when I dive down I realize Herridge was right about the wetsuits. I suffer no brain freeze nor even a body shiver. I’ve been colder surfing in Cornwall at the height of an English summer. When we finally get out, almost two hours later, eyes as wild as the rainforest backdrop, it’s because we can no longer move our arms above shoulder height without sobbing, rather than anything to do with the cold. 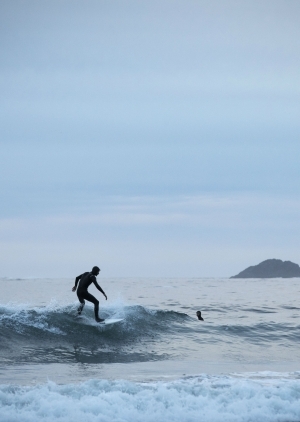 December in Tofino doesn’t always yield such great conditions for less-experienced surfers or those new to the sport. Winter also brings big swells, making it prime storm-watching season. Most of the hotels along the coast provide wet weather gear to guests free of charge and many of the coastal paths are designed to let you view the action closely but safely. The Wickaninnish Inn on Chesterman Beach was very much built with big wave watching in mind at the behest of its owner-manager Charles McDiarmid. He’s been surfing at the picturesque Chesterman Beach since the 1960s after his family moved here a decade before. The Wick Inn, as it’s known locally, pioneered the idea of Tofino as a destination to experience nature’s gnarly winter storms in all their glory. Given that this stretch of coast gets between 10 to 15 megastorms per year, and that a month after our visit they had their biggest swell in a decade with waves the size of houses coming in, I feel even more lucky that we got to surf such gentle waves when we did. Yet, when I wake up the next morning, the ocean does have a lot more roar and fury to it, which is great timing as we’re set to head out for a half-day hike to see some of the coastline’s spectacular blowholes. 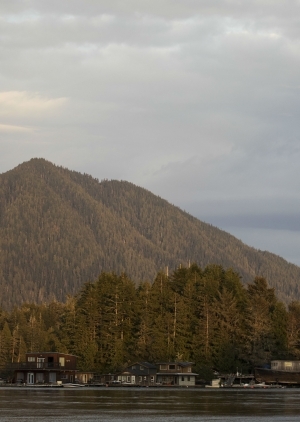 Our route is close to the Pacific Rim National Park on Nuu-chah-nulth territory. But our guide, Kevin Bradshaw from Hello Adventure Tours, has permission from the Ucluelet First Nation (pronounced yew-kloo-let) so it’s alright that we’re walking here as long as we’re respectful of the land. We’re joined by Andrew Crawford from the Ucluelet First Nation who tells me they don’t maintain the start of the path lest too many other people find it and spoil its tranquility. As we walk deep into this amazing old-growth forest, stepping over giant gnarled and knobbly tree roots and bouncing on thick carpets of moss, he tells me the Ucluelet First Nation don’t have a word for wild. That blows my mind as it feels like nature on steroids here, and it might just be the wildest place I’ve ever been. But for Crawford and his people, it’s simply home. We emerge onto a pine-fringed beach, empty of people but full of reminders of the ocean’s power in this part of the world. You don’t get puny pieces of driftwood here – you get entire trees. And you don’t get solitary pieces of seaweed – you get whole bulbous sections of kelp forest. The waves are loud and feisty and there’s seafoam everywhere. It’s a thrilling sight. We scramble up a chain of granite boulders gleaming with seawater and enjoying this natural adventure playground. Then we hear the first blowhole before we see it, a dramatic thud at consistent intervals. We climb one more rock and it’s there – a 15-metre-high jet of ocean spray that looks like an art installation, except way more impressive for being real. The hike was stunning, but perhaps just as enlightening was what I learned about Ucluelet culture along the way. Kevin from Hello Adventure Tours is passionate about sharing human stories with visitors in addition to helping them get their nature fix, but also wants to see it done in the right way. “It’s very important to us to work with local communities so that we can include cultural tourism on our hikes without appropriating the culture,” he explains. On another fresh but blue-skied day the ocean was calm enough to take a boat trip out from Tofino Resort & Marina, where we were fortunate enough to see why this region is often nicknamed the Galápagos of the North. We saw eagles, seals, sea otters, sea lions, porpoises, and to cap it all off, a grey whale breaching. At this point, all semblance of decorum went out the window and I yelped like an infant on Christmas morning. The kelp forests in the Pacific Ocean off the west coast of Vancouver Island are some of the richest in the world, which is why the sealife and sealife-watching opportunities are so fantastic. Kelp is used creatively in some of Tofino’s high-end restaurants. Both kelp and pine are notable flavours of stout and ale respectively in beers made by the Tofino Brewing Company, where we enjoyed a tasting one day at their new brewery bar. Several major airlines run direct flights from Toronto Pearson International to Vancouver International Airport daily. Flights are approximately $600 round trip. 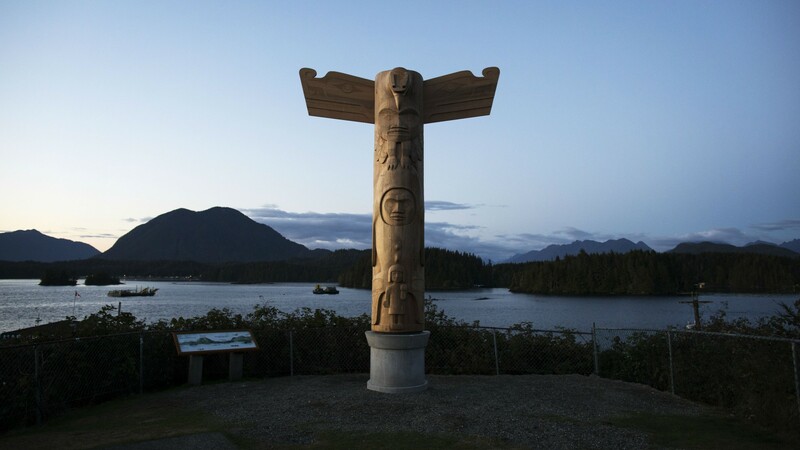 From there you can catch a connecting 45-minute flight to Tofino-Long Beach Airport with Pacific Coastal Airlines. Flights are approximately $300 round trip. December isn’t an obvious time to visit Tofino and surfing in cold water isn’t something I’d have ever expected to enjoy. But as we increasingly use travel to escape our busy city-based lives and press the reset button, it makes a lot of sense to come here in the off-season. That way you can enjoy hiking in this awesome, rugged, edge-of-the-world nature and surfing these perfectly-shaped waves in peace without the summer crowds. You can keep your bikinis and palm trees. For now, this is all I need.